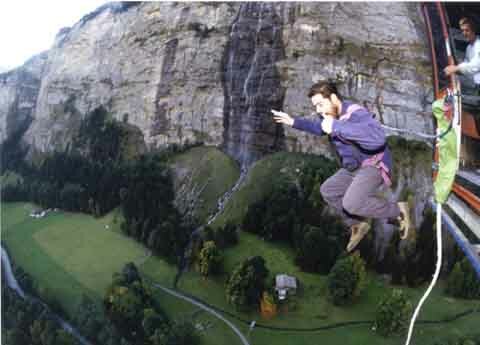 One thing I definitely planned on doing when I got to Switzerland was to bungy jump. There is this outfit in Interlaken that does jumps from a cable car. I told everyone I was going to do it just so I wouldn't chicken out. 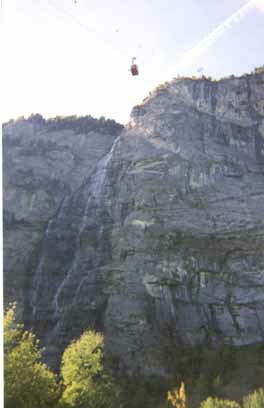 Interlaken is surrounded by the Alps and 2 lakes. They might as well come out with their hands up. It's hopeless. And when I say surrounded, I mean they are right there. Not in the distance. The effect is stunning. In the morning, the clouds are settled near the ground and around 10am the sun and wind clear them out in a 15 minute wonder. I took the boat across Lake Thun and the view of the mountains was awe-inspring. Nothing less. I was one of three doing the second to last jump of the day. All day I had been sitting at a picnic table writing in my journal, watching folk dive out of the cable car. They arrived 15-20 minutes later faces still flush with blood. The constant parade of woo-hooing youth got old. I did get one over on them, tho. I had the idea to have a Mentos with me and mug for the camera on the way out of the cable car. I had no idea how hard that would be, as it turned out, but they let me go ahead with it as long as I taped the Mentos to my hand (to avoid innocent victims, should it come loose). I got to go first since my lower-height jump was on the way up. The other two guys were trying to breathe deeply to relax, but were actually hyperventilating. I was quite nervous, but their stress lessened mine. I actually laughed out loud at one point. They looked at me like I was satan spawn as I cackled. I was being hooked up with my back to the closed door. I had passed on the heel harness to go with just the body harness attached in the back. The guys were muttering in schweitzer deutsch, which sounds weird even to me. I was hoping this wasn't too routine for them. I had been told, warned, not to look down, but sure enough, I did. Damn, but that's scary. The ground looks so small, but not maplike enough to fool the lizard brain into going along quietly with our little plan. My adrenaline level spikes and I catch my breath. I expected them to tap me on the shoulder and explain to me that I had a certain amount of time to jump, etc. After some double-checking, the guy tapped me on the shoulder and I turned around to see the open door. The other guy held up one hand and started yelling "five, four, three.."
This is it I thought. I either hesitate completely, or not at all. I took 2 running steps and hurled myself out the door on "two". The sensation that I was falling was absolutely terrifying. More so, it turned out, coz I didn't have the heel harness to reassure my hindbrain that I had some attachment. I just felt like I was falling off a cliff. My brain was relieved of command, while my body attempted to save the day. The people on the ground said it was amusing the way I tried to swim back up to the cable car. They also said I yelled "it's a bird, it's a plane" at one point after my initial bounce, but I have no recollection of that. I had no post-trauma experiences like my first skydive. Moral of the story: bungy jumping is unfathomably terrifying. Skydiving isn't. 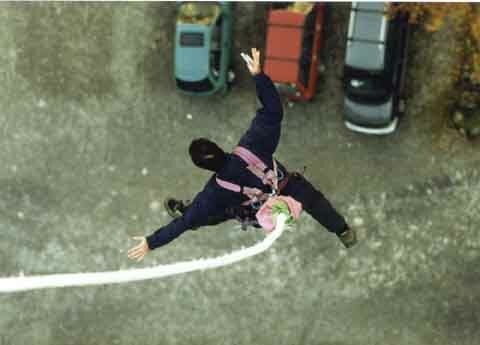 While I'd bungy again, I never would have skydived if I had bungied first. Word.